EC-Cult™ media and reagents are xeno-free (XF) and specifically formulated to support optimal derivation and growth conditions for primary human endothelial colony-forming cells (ECFCs) and mature endothelial cells (ECs) from human cord and adult peripheral blood. These specialized products are extensively tested to allow researchers to standardize their culture systems and minimize experimental variability, ensuring reliable and reproducible results. DEFINED AND OPTIMIZED. A defined medium that does not require additional growth factors. CONVENIENT. Media and reagents are provided in easy-to-use formats. HIGH-PERFORMANCE. Supports greater clonogenic properties of ECFCs and expansion of mature ECs than other commercially available media. RELIABLE. Rigorous raw material screening and quality control minimize lot-to-lot variability and increase reproducibility between experiments. (A) A schematic of the ECFC assay for enumerating ECFC colonies derived in Complete EC-Cult™-XF ECFC Medium. 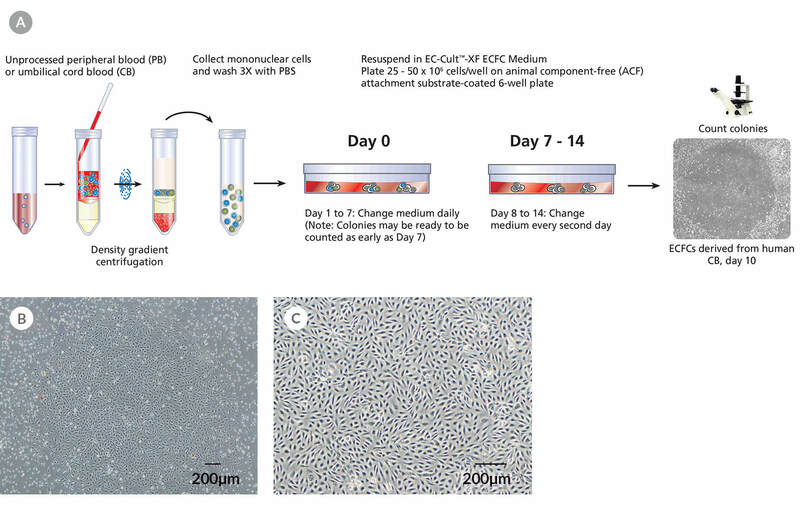 On Day 0, mononuclear cells are isolated from whole blood and plated on animal component-free (ACF) Cell Attachment Substrate-coated plates in Complete EC-Cult™-XF ECFC Medium. From Day 1 to 7, nonadherent cells are gently removed through daily medium changes. From Day 8 and onwards, the medium is changed every second day until ECFCs are ready to be passaged. Each ECFC colony can be enumerated around Day 10 before the colonies begin to merge onto each other. (B) A representative phase contrast image of an ECFC colony at Day 11 derived from human umbilical cord blood (CB) in Complete EC-Cult™-XF ECFC Medium. (C) A representative phase contrast image at passage 3 of ECFCs derived and expanded in Complete EC-Cult™-XF ECFC Medium. 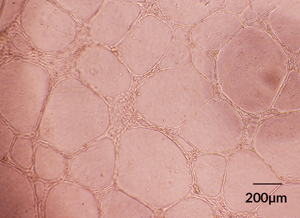 These cells grow as monolayers and retain their typical cobblestone-like morphology of endothelial cells. 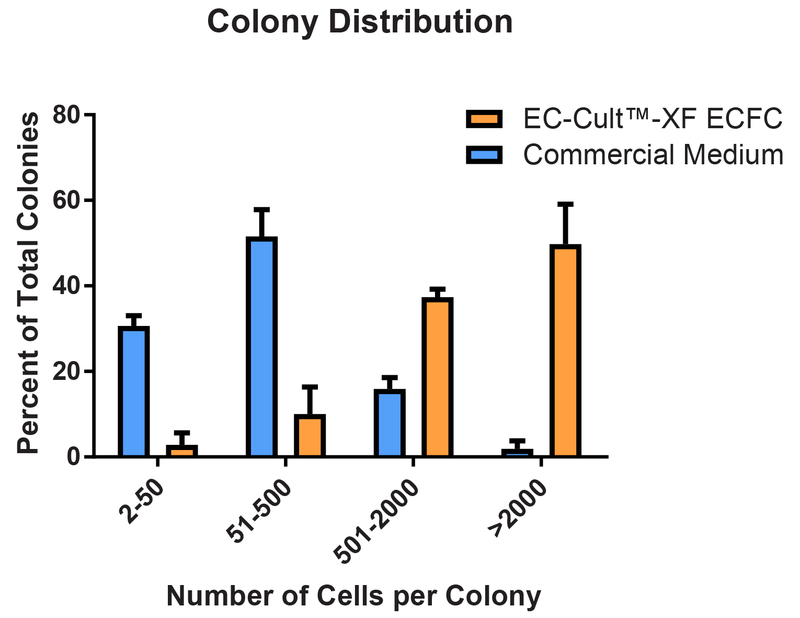 Human CB-derived ECFCs expanded in Complete EC-Cult™-XF ECFC Medium demonstrate greater expansion rate when compared to ECFCs expanded in a Commercial Medium. 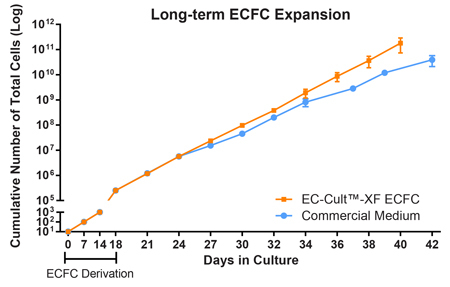 In late passages, cell cultured in Complete EC-Cult™-XF ECFC Medium continue to expand at the same rate as in early passages, while the rate of expansion in cultures expanded in a Commercial Medium begins to decline as early as passage 6 (n = 4). Human CB-derived ECFCs expanded and plated starting with one cell per well in EC-Cult™-XF ECFC Medium or Commercial Medium form colonies of varying sizes over a 14 day period. Assessment of colony formation and size is used to determine their hierarchical proliferative potential. 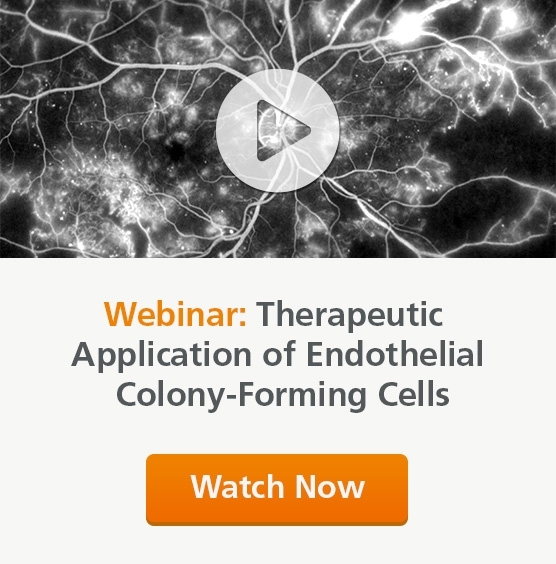 The assessment includes counting and classifying the number of cells per colony as endothelial clusters (2-50 cells per colony), low proliferative (51-500 cells per colony), medium proliferative (501-2000 cells per colony) and high proliferative (greater than 2000 cells per colony) ECFCs. In Complete EC-Cult™-XF ECFC Medium, approximately 40 to 60% of dividing ECFCs form well-circumscribed colonies containing greater than 2000 cells at the end of the 14-day culture. A greater proportion of high proliferative ECFCs are maintained when ECFCs are derived and expanded in Complete EC-Cult™-XF ECFC Medium. Approximately 2% of the colonies are high proliferative when cultured in a commercial medium. Vertical lines indicate standard error (n=3). ECFCs derived and expanded for 5 passages in EC-Cult™-XF ECFC Medium (A) maintain the expression of classic ECFC and endothelial cell surface markers (CD31 and CD144) and (B) lack the expression of hematopoietic marker, CD45. ECFCs derived and expanded for 5 passages in EC-CultTM-XF ECFC Medium are able to spontaneously assemble into capillary tube-like structures overnight on Matrigel®. Sakimoto S et al. (2017) CD44 expression in endothelial colony-forming cells regulates neurovascular trophic effect. JCI Insight 2(2):1-16.